Many of the great works of world literature are composed in metrical verse, that is, in lines which are measured and patterned. Meter in Poetry: A New Theory is the first book to present a single simple account of all known types of metrical verse, which is illustrated with detailed analyses of poems in many languages, including English, Spanish, Italian, French, classical Greek and Latin, Sanskrit, classical Arabic, Chinese, Vietnamese, and Latvian. This outstanding contribution to the study of meter is aimed both at students and scholars of literature and languages, as well as anyone interested in knowing how metrical verse is made. 1. A theory of poetic meter; 2. English strict meters; 3. English loose meters; 4. Southern Romance Carlos Piera; 5. French; 6. Greek; 7. Classical Arabic; 8. Sanskrit; 9. Latvian; 10. Meters of the world; 11. The metrical poetry of the Old Testament. 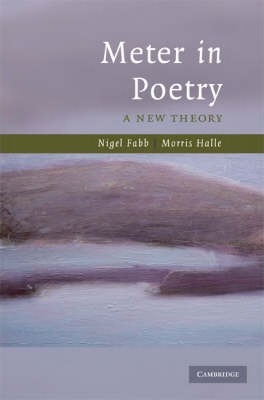 Nigel Fabb is Professor of Literary Linguistics in the Department of English Studies at the University of Strathclyde. His recent publications include Sentence Structure Second Edition (2005) and Language and Literary Structure (Cambridge, 2002). Morris Halle is Institute Professor Emeritus in the Department of Linguistics and Philosophy at Massachusetts Institute of Technology. His recent publications include The Sound Pattern of English (with N. Chomsky, 1991) and From Memory to Speech and Back (2002).